English Heritage will once again welcome people to Stonehenge to celebrate the Winter Solstice. Sunrise is just after 8am on Tuesday 22nd December and visitors will be able to access the monument as soon as it is light enough to do so safely. Many people – not least diary manufacturers – believe that the Winter Solstice always falls on 21st December. 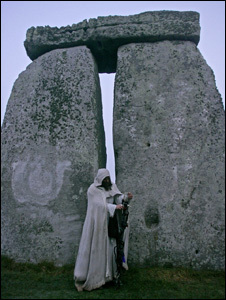 But the celebration of Winter Solstice at Stonehenge is not fixed to a specifiic date – this is because of a mismatch between the calendar year and the solar year. Please read and respect the Conditions of Entry for Winter Solstice 2015 and the English Heritage website. Please be aware that parking is very limited. There is a thirty minute walk, depending on where you are parked, in low light or darkness, from the parking areas to the monument. You are therefore strongly advised to bring a torch with you for personal use. Please note that there are no other amenities or facilities available to visitors until such time as commences. Please read and respect the Conditions of Entry.